Gratitude of Diamond Necklace team! Yesterday the first venture of LJ Films completed hundred and one days! Diamond Necklace is continuing its run in Thiruvanathapuram Sripadmanabha, Kochi Padma Screen two, Kozhikkode PVS Film City and others. 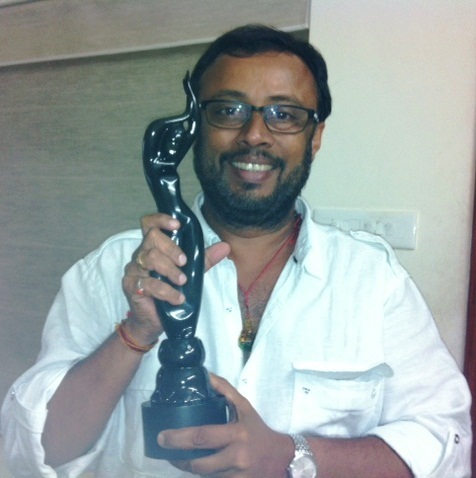 Personally its a humbling occasion for me and true appreciation from you all for the professional film making venture! Hope to be worthy of your love and good wishes in the coming ventures too!! The Necklace comes home to Dubai!! Thanks for the patient wait of all wellwishers and friends in Dubai..
Atlast the film, Diamond Necklace has its show case in the following screens from this week. Beyond the sheen and sparkle…! As you may be aware, I could not find enough time to sit in peace and write to you in the last couple of weeks! 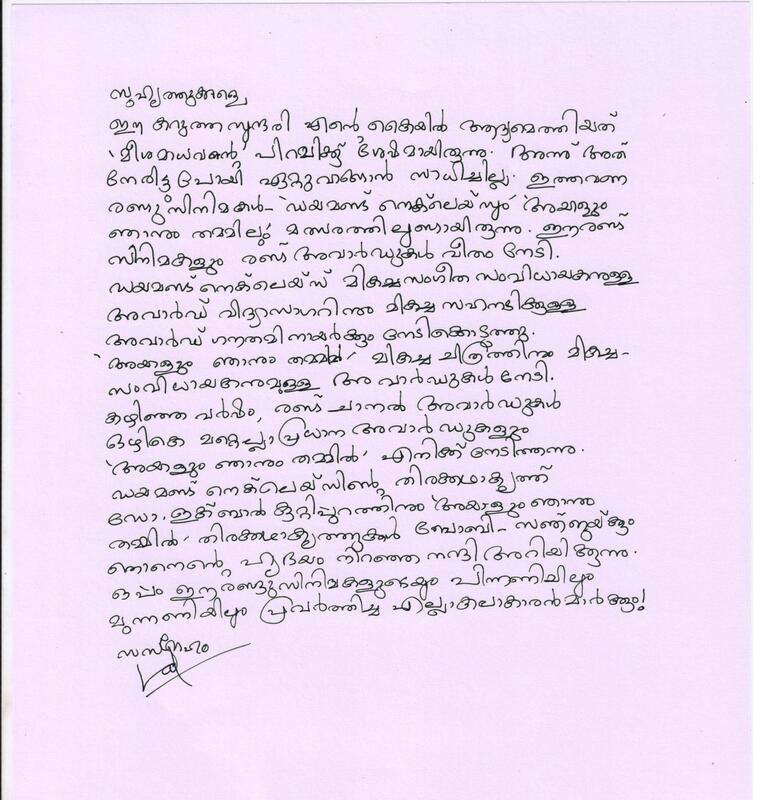 Release of Diamond Necklace was not the release of any regular Lal Jose film! It was the film produced by P.V Pradeep’s Anitha Productions in association with LJ Films Pvt. Ltd and the first film being distributed by LJ Films. The responsibility shared for production was good in terms of reduced tension while making the film. I got up to date and handy technology support for direction. But distribution is a totally different ball game!! In most of our towns the number of theaters is low. And now, we have the holiday season! 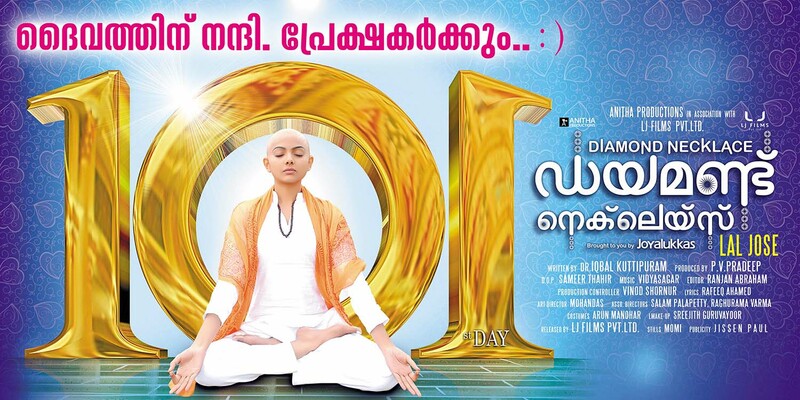 `Ordinary’, released in March, `Maya Mohini’ and `22 Female Kottayam’ of April, were continuing their lead with good collection reports. Moreover, `Grand Master’ and `Mallusingh’ were awaited along with Diamond Necklace. For us, getting good theaters were truly a challenge! I would gladly say these are the days of `spring’ for Malayalam films… Films of different nature and categories… all being upheld by the audience and theaters being `Live’ again! In the first week, Diamond Necklace was released in 24 selected theaters all over Kerala. Now the number has grown to fifty theaters. The film is released in 35 theaters of other states in India. We have got very good response from viewers all over India. Some lone attacks from media did occur! I understand that none of that influenced the viewer who watched the film in all his/ her sincerity from expressing an independent opinion. And that is positive and invigorating! The only note of dissent came about including in-film advertisement. All around the world, films effectively find their budget from such sources. I believe there is nothing wrong in availing the resource without hampering quality of story and its craft! We may not be able to do it for all films. It depends on the subject and special nature of narration. L J Films Private Limited is going to be live in distribution. I promise to distribute those films that showcase novelty along with quality of idea and presentation without taking into account the status of technicians or stars who have contributed in their making. 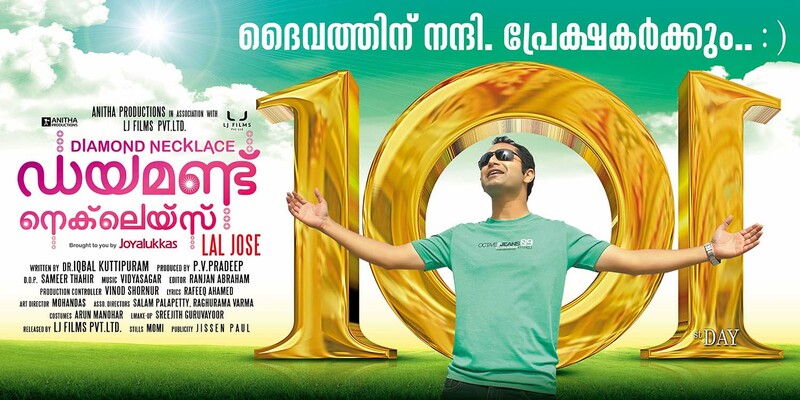 The next distribution venture of L J films is going to be `Thattathin Marayathu’ by Vineeth Sreenivasan. It will be in theaters by July 6th. It narrates a charming tale of two youngsters in love! Diamond Necklace has to reach a lot more screens. It will complete its cycle mostly when monsoon reaches its pinnacle. Pray the rains will not dampen the spirits of my beloved viewers from reaching theaters to see the movie! This post has become lengthy, as I have not conversed with you for so long! I am getting ready for a journey.. A custom after each film! This time my family, Dr.Iqbal and his family joins the trip. Definitely would keep you posted as I am back..
Diamond Necklace is releasing today! Thank you for the keen follow up and loving remembrances! Your prayers and positive energy has given us great hope! Please watch the movie in the theater near you and request all your dear ones to watch the movie at the earliest! Diamond necklace went to censored early today. All who saw the film were pleased to give a clean U certificate to the film!!! Now moving on to the theaters near you!